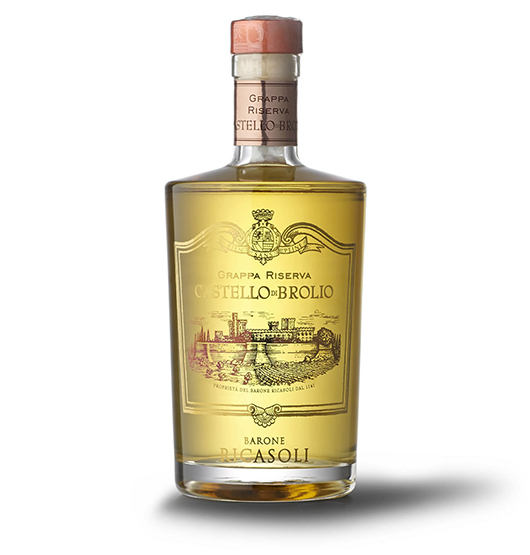 Distilled pomace of Chianti Classico grapes that go to produce the Castello di Brolio wine. The grape skins and seeds are distilled in batches using the traditional method “a caldaietta”, characterised by the slow heating of the skins and seeds with steam produced by a special boiler. This method ensures that the distilled product preserves the grape’s original characteristics. Absolutely transparent amber yellow in colour; intense, forthright nose showing delicate notes of blackberry in the finish. It weds enormous elegance with a good balance of aromas ranging from flowery, fruity notes to gentle hints of vanilla and oak. Serve at a temperature of 17°C.